Since its establishment in 2001, Tenuta Coppadoro has fast become the new benchmark for quality winemaking in the southern Italian province of Puglia. Coppadoro's vineyards are located on the Gargano peninsula, a promontory of land projecting out from the Italian coastline into the Adriatic Sea; it forms the “spur” above the heel formed by Puglia's Salentino peninsula. Home to Italy’s largest national park, the area is characterized by thickly forested ravines and sunlit valleys, likened to bowls, or coppe in Italian; hence the winery name, meaning "Bowl of Gold." 75% Nero di Troia; 25% Aglianico, this wine is the result of a blend of two native red grape varieties, grown in 112-acres of vineyard planted in the San Severo hills. Vineyards are planted 2,500 vines per acre, with a final yield of 60%. 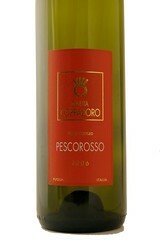 The wine shows aromas of very red currants and wild strawberries, with delightfully spicy notes of fresh black pepper. Flavors are fresh, vibrant and well-rounded with excellent body and balance.